my philosophy on decorations is this. if you can use it again, spend the money. i took an empty diaper box & wrapped it in red wrapping paper. 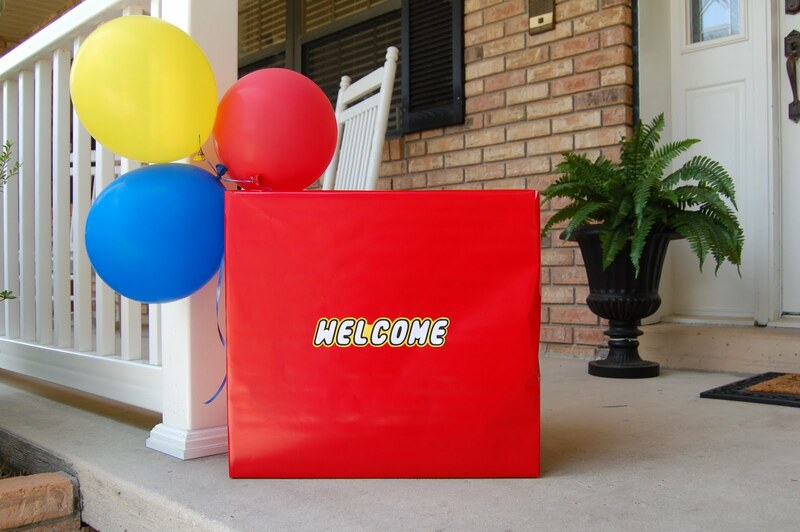 i printed out the word 'welcome' on regular old computer paper, colored around the outside edge with a yellow sharpie & cut it out. attached some balloons on curling ribbon & set it out on the front step. 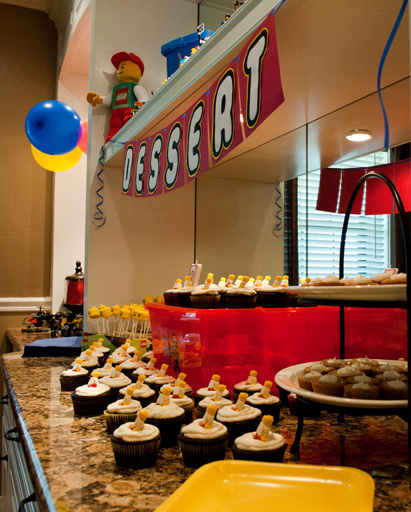 since we served the food buffet style, i put the plates, napkins & forks on the buffet. i covered the table in a blue plastic tablecloth from family dollar, and made a runner out of bubble wrap. i got the idea from delia creates. i didn't read the tutorial, i just sort of flew by the seat of my pants. let me tell you. you definitely want to spray the bottom side of this, not the bubble side. i ended up having to spray both sides. i did the bubble side first & it ended up very uneven. i had to go back over the smooth side to get it look evenly coated. it took a can & a half of green spray paint to do 3 12' pieces. i cut a dowel rod in half & spray painted it green because it's what i had on hand. my mom cut up some floral foam & wedged it into a ceramic pot, then we covered it with duplo legos. for the balloons, i blew up the balloons & tied them to a piece of fishing line. once i felt i had enough on there, i just started wrapping it around the dowel. nothing technical. it wasn't pretty underneath, but thankfully the balloons covered all that up! for the decorations on the dessert buffet, i started with my brother's old legos, that are still constructed, living up & away from little hands in his old bedroom closet. my mom cleaned them up & we set them out. there is a tow truck on the left side, as well as a helicopter. 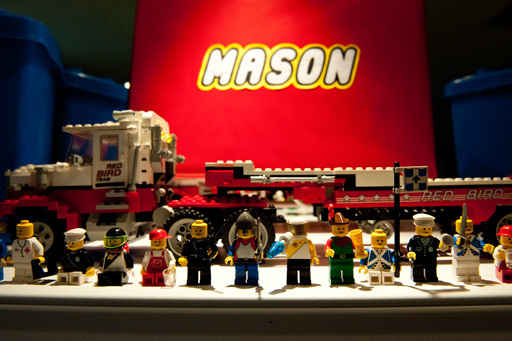 up top is a semi with a flatbed & some of mason's new lego racers. i printed out my letters in the lego font, at size 500. the idea came from this party here @ homemaking fun. i again colored around the edge with a sharpie marker & cut it out, attaching it to a piece of red cardstock. i punched holes in the top of each corner & strung it onto blue curling ribbon. the red box with mason's name on it is actually his present from us. i wrapped it in the same red paper as the 'welcome' box & added his name in the same manner as the 'welcome' box & dessert banner. i went through & put together a bunch of my brother's old minifigures & set them out on the edge of the shelf. 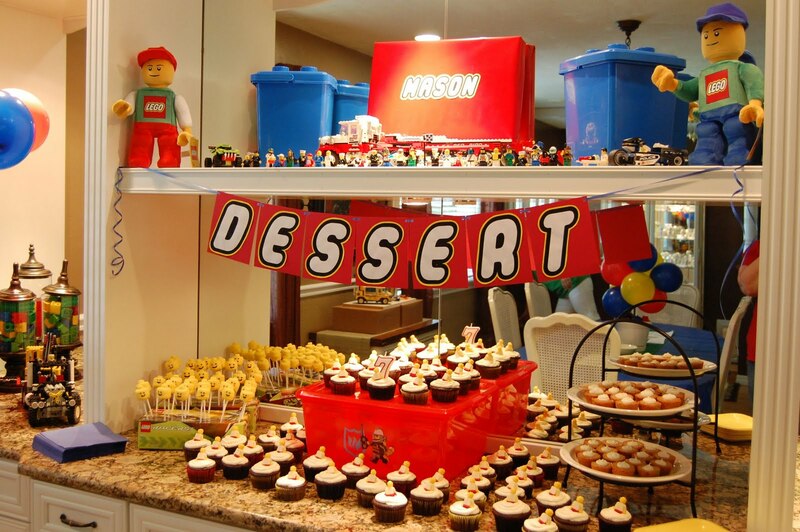 mason is all about the minifigures! it was so cool to see all the different minifigs. from policemen, to emts, to colonial soldiers & what i can only describe as some of robin hood's merry men! i'd be happy to answer! for the overview lego post click HERE. for the invitations click here. 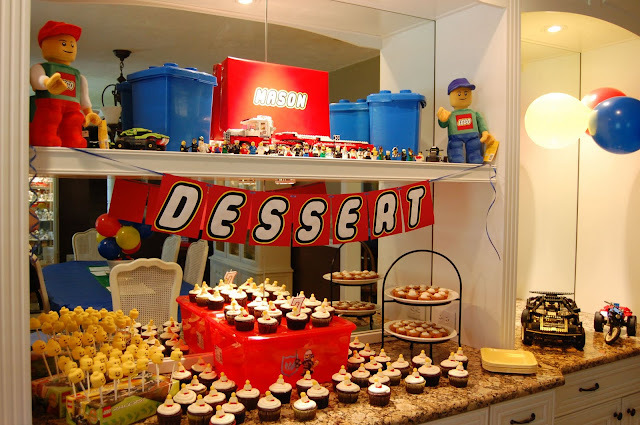 This set up is amazing - I love the dessert buffet! Oh Kristy! 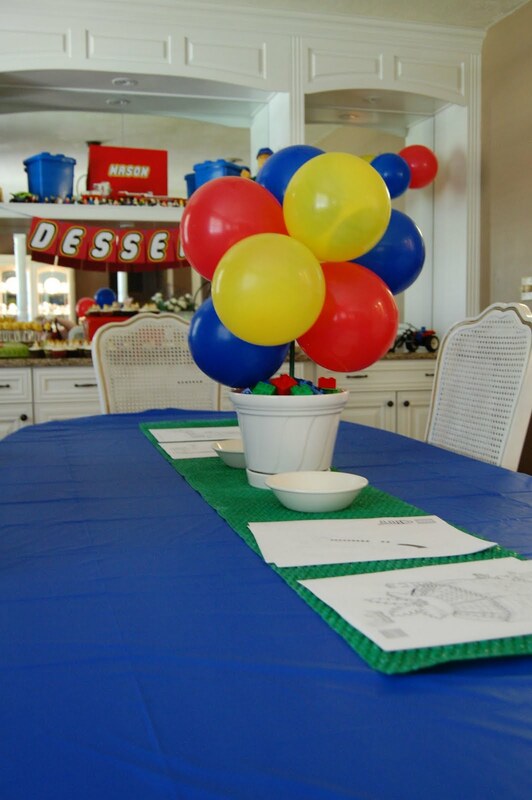 Your party looked absolutely amazing! You are sooo talented! Thanks so much for sharing it with us at the Pretty Packages Party! The link to download the font is broken... Is there another link available? 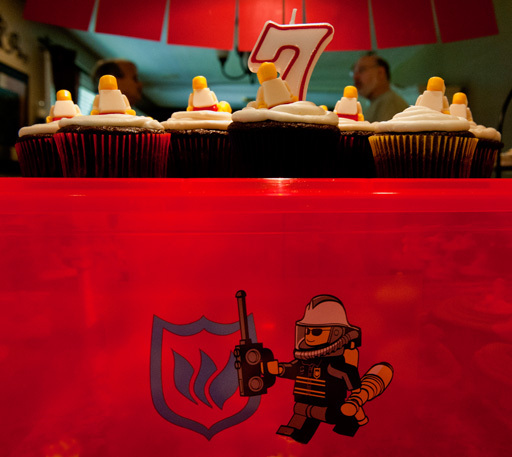 Love your party details!